At around 10.45am on July 4th 1905, a young policeman succumbed to a gunshot wound he had received earlier that day. This was not the first such incident that year in Paris - or even in the previous 30 days - but several elements were reunited this time to make the case particularly memorable. Reported in breathless detail by the press the next day, the incident itself was as banal as it was pointless. A group of young men were thrown out of a bar at closing time into the path of two patrolling policemen. After trying in vain to calm the men down and disperse them, they eventually decided that would need to set an example by making an arrest. However, as they were slowly dragging one individual towards the police station, a shadowy figure from the back of the crowd pulled out a gun and fired in the direction of the police officers. One of the two officers, a young man named Joseph Besse, was hit in the head and never regained consciousness. 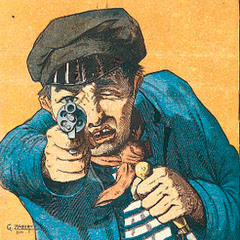 The killing of the police officer understandably caused outrage in the press, but in this particular case, one of Besse's colleagues (a certain Eugène Corsy) shortly afterwards published full (and surely exagerrated) details of the event in a book*, thus ensuring that the story remained for a longer period in the collective conscience. Both sources focussed on several elements in particular. It escaped nobody's notice that this was Besse's first day (night) on the job. "Detail navrant" explained Le Petit Journal, "c'était la première fois que Joseph Besse, qui avait terminé son stage le matin même, sortait en uniforme" (a depressing detail - it was the first time that Joseph Besse, who had finished his training the same morning, patrolled in uniform). In his book, Corsy played up the romantic tragedy of this fact by introducing an element of predestination to the tale. Each police officer had a unique number stitched onto the collar of his uniform, and the lady who did this for Besse was also apparently something of a fortune teller. "La bonne femme..(m'a dit)..que le 104 était un mauvais numéro, fatal, et qu'il m'arriverait sûrement un malheur avant peu" (the woman (told me) that the number 104 was fatally cursed, and that something bad would surely happen to me soon), Besse was said to have told his fellow officer on the night of the attack. In all of the versions of the story, Joseph Besse is a passive and doleful figure of misfortune, a kind of giant child in uniform. In reality, he was not especially young. He was 25 years old when he died - several years older than those who attacked him (his killer was 19), and had just finished three years of military service. Interestingly, his death was described as being all the more surprising because of his 'très haute taille' (exceptional height) and supposed strength - he was described as a 'veritable colosse' by Le Petit Journal. A little further along in the article though, we learn that Besse in fact measured 1m85 (6ft 1in) - probably a low average for police officers today. If there was one factor that really caught the interest of the press and public though, it was the location in which the attack took place. At the beginning of the 20th century there was a kind of moral panic about a group of supposedly lawless individuals known as 'apaches' (see this previous Invisible Paris post for more details) who were said to haunt large territories in the east and north of the city. For certain newpapers though, the neighbourhood was not terrorised simply because everyone in the neighbourhood was a degenerate. Le Petit Journal emphasised reports that nobody in the district came to the assistance of the police officers, and worse still, that those living in the area threw objects out of their windows directly at the two representatives of the law. It is interesting to compare the neighbourhood of the time with the layout of the streets today. Corsy, once again, paints a rosy picture of the neighbourhood. "La rue des Amendiers était sillonnée de ruelles, impasses et culs-de-sacs ténébreux et infects où l'air et la lumière ne pénétraient qu'à grand-peine" (Criss-crossing the Rue des Amendiers were foul and gloomy back-alleys, dead ends and cul de sacs, where air and light entered with great difficulty). 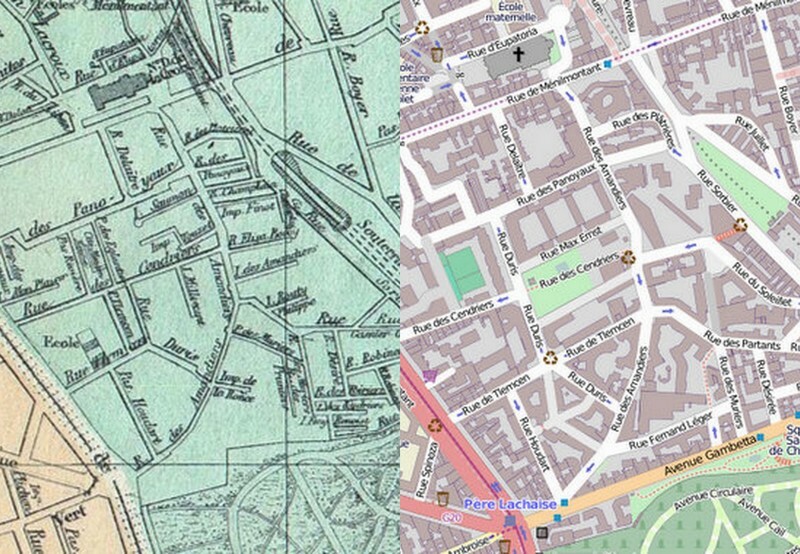 Looking at the two maps, the main structure of the neighbourhood appears to be very similar, but if any of the characters in this story were to return to today, it is unlikely that they would recognise anything. Notably absent are the warrens of small passageways. In their place today are large blocks of apartments, constructed mostly in the 1970s and 80s. It has become a slightly dull part of the neighbourhood, a residential district probably giving today's policemen very few problems. One question remains at the end of the story - what happened to Besse's assassin? Despite the concerns about the neighbourhood and the morals of its inhabitants, the murderer - Félix Boulay - was quickly identified and denounced. The police tracked him down to a hotel in Vincennes, and he was arrested two days afterwards. Boulay was initially sentenced to the death penalty, but was saved when Armand Fallières, an abolotionist, was elected as the new French President. Felix Boulay was instead deported from France for life to an unknown location. Joseph Besse received a posthumous gold medal and a largescale funeral ceremony at Notre Dame before being buried in the family tomb in Bray-sur-Seine. *This book - called 'La medaille de mort' was recently republished in paperbook coupled with the 'Memoires de Casque d'Or', perhaps the most famous 'apache'. 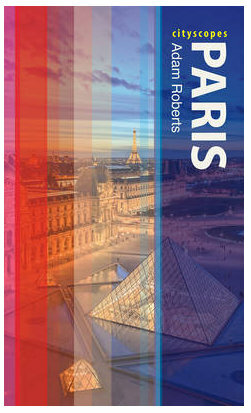 The publication is called 'Chroniques du Paris apache', and can be found here. Interesting post. I like it! Very enjoyable posting, loved your description of Besse as "kind of a giant child in uniform."